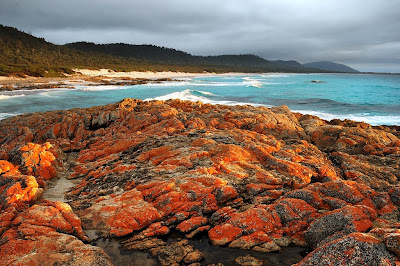 Had a somewhat leisurely visit and walk at the Friendly Beaches just north of Coles Bay at the weekend. The camping are here is quite nice, with well spaced campsires, mainly occupied. I got the last one that I could see when I got there. The toilet near my tentsite was somewhat less salubrious, but tolerable. It's nowhere near as bad as the one I once used at Hammersley Gorge in WA - a former long-drop, which had become a short-drop. I'm not sure why they haven't replaced the toliets here with composting ones, as they must get a lot of use. 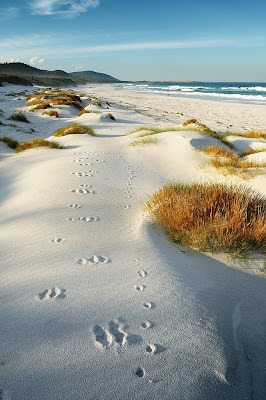 Had a few swims, and the water was really warm for Tasmania. Lovely place, well worth a visit. Walking north along here you could probably get to Bicheno. There might be some tricky rocky sections as you approached Cape Lodi. A few kilometres north of Isaacs Point (where the road accesses the beaches) you come to what appears to be private property. There were trail bikes, 4WDs and a shack/campsite here. A walk to the south might be better, and next time I'll try that. 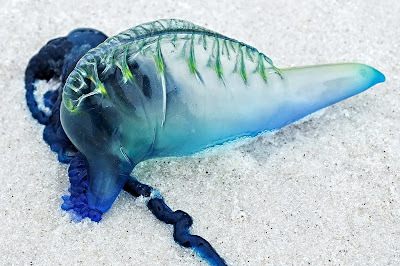 These bluebottles (PDF, 1MB) (Physalia utriculus, I believe) were washed up all along the beach. Didn't strike any in the water, just lucky I guess.